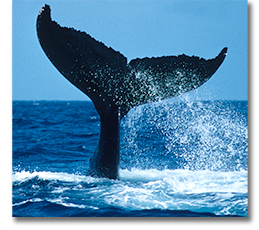 The program begins with an introduction to whales in general and humpback whales in particular. 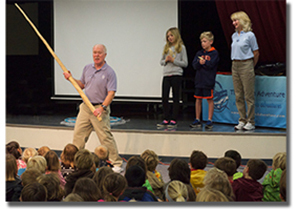 Students are chosen from the audience to demonstrate how whales are adapted to their environment. Specimens and models are used to help demonstrate how whales are different from bony fish and the different ways whales catch their food. See real whale baleen, teeth, vertebrae and a seven foot long narhwal tusk! 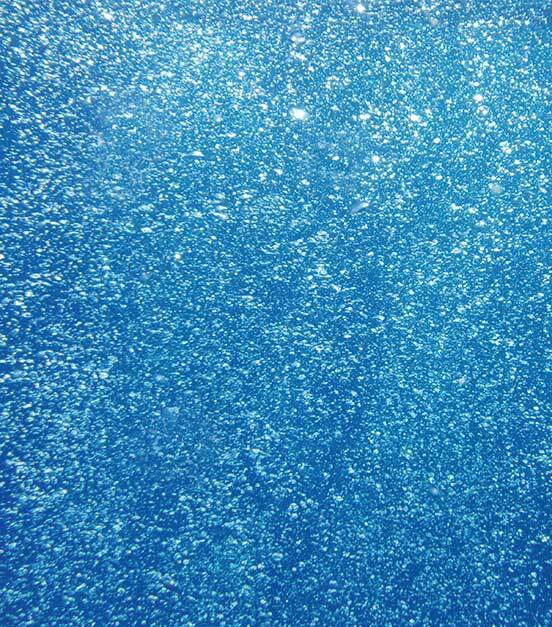 See real krill and watch how humpback whales make "bubble nets" to catch the krill. After the demonstrations, undersea explorers, Wayne and Karen Brown, take your students on their exciting adventure, via a fascinating, high-definition digital multi-image presentation, in search of humpback whales in their winter breeding grounds, in the warm waters of the Silver Bank by the Caribbean Sea! In this multi-image presentation your students join the Browns on the expedition boat where they meet the captain. As they accompany Wayne and Karen on the expedition, your students see male humpback whales competing for mates and hear males singing underwater love songs to attract females. The highlight of the presentation is our swim with a mother humpback whale and her newborn baby. After mating season in the Silver Bank your students join Wayne and Karen in Gloucester, Massachuesetts, home port of the movie "The Perfect Storm". In Gloucester the Browns will join whale researchers on another expedition boat as they travel to the humpback whales' feeding grounds in cold waters of the Stellwagen Bank, off the coast of Massachuesetts. 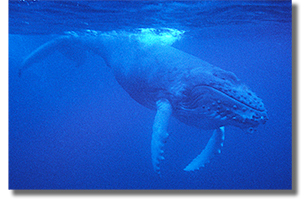 Your students will see mother humpbacks teaching their babies how to catch their food by making "bubble nets". After the multi-image presentation, your students come literally face-to-face with a baby humpback whale when they meet "Herby" the 20 foot inflatable humpback whale. As time allows, at the end of the presentation a brief time is set aside for a questions and answers.